Shoreline / streambank stabilization problems are usually caused by an excessive amount of wave or ice action, frequent water level fluctuations, or energy being diverted from adjacent streambank / shoreline areas with more robust stabilization practices in place. 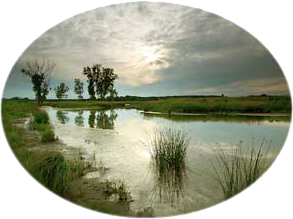 Landowners often have to take action to correct these problems. However, poorly planned or implemented stabilization projects may not only cause unintended consequences on the property where they are implemented, but on adjacent parcels as well. For these reasons, the proper regulatory permits must be applied for, and approved, before any new shoreline / streambank stabilization practices can be installed, or before any major repairs that require the importation of materials, whether soil, sand, rock, concrete, railroad-ties, treated wood, seawall, etc. Failure to obtain all the proper permits before implementing a shoreline / streambank project can result in fines, penalties, and prosecution by the permitting agencies. 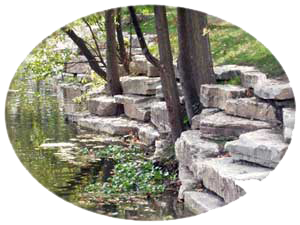 To begin with, the Wonder Lake Master Property Owners Association (MPOA) does not issue ANY permits for new shoreline or streambank stabilization practices, or for repairs to existing shoreline practices. Permits are instead obtained from the U.S. Army Corps of Engineers and either McHenry County or the Village of Wonder Lake. However, as part of applying for permits from McHenry County or the Village of Wonder Lake (as discussed below), the MPOA will review shoreline permit applications to determine whether the proposed project may cause an encroachment onto the MPOA-owned lakebed, and make their recommendations to the County / Village, as applicable. To help the MPOA make this determination, anyone applying for a shoreline permit from the County / Village will be required to complete and submit the MPOA application form found HERE. As detailed on that form, any proposed seawall project must provide a CURRENT plat of survey, generated by a Professional Land Surveyor, showing the current position of the lake shoreline relative to the platted lakeward boundary of the subject parcel. Projects using rip-rap or other “lake-friendly” shoreline practices will not be required to submit a current survey to the MPOA. The applicable regulatory agencies are discussed below. Any project that will result in the placement of material (soil, sand, rock, concrete, railroad-ties, treated wood, seawall, etc.) or grading / filling below the high water level of Wonder Lake: jurisdictional wetlands, or within / along any of the stream channels flowing into Wonder Lake, will require a regulatory permit or regulatory clearance from the U.S. Army Corps of Engineers. Under the County-wide McHenry County Stormwater Management Ordinance (SMO), any project that will result in the placement of material (soil, sand, rock, concrete, railroad-ties, or seawall) or grading / filling below the high water level of Wonder Lake; within regulatory flood plain areas; jurisdictional wetlands;, or within / along Nippersink Creek downstream of Thompson Road, will require a regulatory permit or regulatory clearance. If the shoreline property is located within the Village of Wonder Lake, the Village should be contacted about applying for the SMO permit. If the shoreline area is located within unincorporated McHenry County (not within the Village of Wonder Lake), then McHenry County Department of Planning and Development should be contacted about applying for the SMO permit. Contact Info: McHenry County Department of Planning & Development,, 667 Ware Rd. Room 208, Woodstock, IL 60098. Phone: 815-334-4560, Fax: 815-334-4546.